The Assassination of RFK: A Time for Justice! Way back in 1960s America, a series of three major political assassinations marked the end of a rich and optimistic period with lower income differences, where the imminent threat of nuclear war was thrice averted. Controversy surrounds each assassination, implicating a shadowy military industrial complex and the CIA operating to undermine democracy and promote war and inequality. On Nov 22 1963 US President John F. Kennedy was assassinated in Dallas. One of many consequences was the continuation and escalation of the Vietnam war. In April 4, 1968, Martin Luther King, the US's most famous black leader, was assassinated in Memphis. On June 5, 1968 John F. Kennedy's brother, Bobby Kennedy, was assassinated in Los Angeles. For each of these assassinations a lone gunman was officially held responsible. In 1999, UK barrister William Pepper, obtained a jury verdict (PDF - 3.2MB) that the US armed forces and police had, in fact, conspired to murder Dr. Martin Luther King. Pepper now claims to have new evidence which he says proves 68 year old Christian Palestinian, Sihran Bishara Sirhan, could not be guilty of the assassination of Bobby Kennedy on 5 June 1968, for which Sirhan has, so far, served 44 years. A new analysis of acoustic evidence shows that 13 shots were fired the night of the assassination, whilst Sirhan Sirhan only fired eight in a hypnotic state, including six with the hand holding the gun restrained and pointed beneath the table. In 2006 The Guardian published Shane O'Sullivan's investigation, which makes similar claims. Barrister Pepper is now seeking a re-trial. The shot that killed Robert Francis Kennedy was fired from behind his ear and no more than one inch away, whilst Sirhan was at all times in front of Bobby Kennedy. Had Bobby Kennedy lived, he would have won office. As president, in addition to resuming his late brother's good work domestically and internationally, he intended to conduct a new and more thorough investigation into the 1963 assassination of his brother, President John Fitzgerald Kennedy (JFK). Bobby Kennedy, however, gave no outward indication that he did not accept the findings of the Warren Commission that Lee Harvey Oswald, acting alone, had murdered John Fitzgerald Kennedy. He failed even to offer public support to attorney Jim Garrison, who was at the time filing charges against New Orleans businessman Clay Shaw for his alleged participation in a conspiracy to assassinate President Kennedy. (Garrison's very convincing analysis of the evidence is minutely explored in Oliver Stone's remarkable movie JFK (1991).) Robert Kennedy clearly judged that his chances of gaining the office of President would have been harmed, rather than helped, by his giving public support to Garrison's inquiry. More thought and considered discussion with his friends might have helped Robert Kennedy to see that his reasoning in this was flawed. Had he come out and publicly endorsed Jim Garrison's prosecution, that prosecution would have gained a much higher profile. With a higher profile, it would almost certainly have achieved a lot more than it did. Results would have included a public much more knowledgeable of the suspicious circumstances surrounding JFK's murder. With a well-informed public, it would not have been possible for Bobby's murderers to cover their tracks in the way that they subsequently did. Without that possibility, perhaps they would not have carried out Bobby's assassination. Historians should pursue this line of inquiry to determine whether or not a person or persons close to him influenced Robert Kennedy to remain publicly silent about his lack of confidence in the Warren Commission's lone gunman findings. This has not happened, to my knowledge, to date. What is the importance of these cases for the world, so many years later? With Jim Garrison's case against the lone gunman theory of President Kennedy's assassination and Barrister Pepper's successful jury verdict that conspiracy was involved in Martin Luther King's assassination, if conspiracy can also be shown in Robert Kennedy's assassination, then this would point to the existence of organised forces in the US government that prevent candidates they don't like from holding office. Such a finding would call all US governments since JFK's assassination into question. If exposed by further inquiry, such forces would be likely to represent the interests of powerful people who are behind the resource wars of today, part of the warlike military-industrial complex which President Eisenhower's warned was rising in his farewell Presidential address. [See on you-tube]. This introduction precedes the fascinating forensic discussion below, which is about why Sirhan Sirhan could not have killed Robert Kennedy. This past March 19th Sirhan Bishara Sirhan turned 68. A Jordanian Christian convicted of the assassination of United States Senator Robert F. Kennedy on the night of June 5th 1968, Sirhan has spent the last 44 years behind bars, currently at Pleasant Valley State Prison in Coalinga, California, framed for a crime he did not commit. A quick Google search this past week is revealing: One finds very little news items memorializing the assassination or the circumstances surrounding the murder of the presumptive next President of the United States, amounting to a virtual amnesia in the public mind regarding the death of RFK, friend and associate of Martin Luther King Jr., also murdered a few months earlier. "I was told by my attorney ... that I shot and killed Senator Robert F. Kennedy and that to deny this would be completely futile ... (but) I had and continue to have no memory of the shooting of Senator Kennedy." Sirhan stated this on August 9th in 1997 in "Exhibit J. Declaration of Sirhan Sirhan," one of number of exhibits, declarations and briefs recently submitted to a California court that definitively show that Sirhan was set up and framed for the murder of Senator Kennedy, a manipulated and coerced patsy in the assassination of a popular leader who like his brother John, assassinated in 1963, was perceived as a threat to the structures of power in America. A little more than a year ago, on April 23, 2011, attorneys Dr. William Pepper and his associate, Laurie Dusek, filed a 58 page supplementary brief with the Honorable Andrew J. Wistrich, United States Magistrate Judge, US District Court, Central District of California, "requesting relief" in behalf of Sirhan. In the brief, they stated that, "petitioner requests that this court set this matter down for an evidentiary hearing and issue a writ of habeas corpus." In other words, they are seeking a new and thorough review of all the evidence in the case, including new and expository testimony that threatens to topple the official story. Recently, they intensified their argument, setting forth proof of a "fraud on the court" involving the documented substitution of critical evidence. According to Pepper, "they put fabricated evidence into court before the judge and jury ... for the first time in 43 years of this case, we think we have the evidence to set this conviction aside." Given that the extensive testimony, which as we shall see, sets forth a convincing case for Sirhan's innocence, it will be hard if not impossible for Magistrate Wistrich not to grant such a hearing. But we know better don't we! That is why this is being written, to inform you, the American people, that at this moment, as you read this, in a courthouse in the Central District of California sits evidence which tends towards proving the innocence of Sirhan and more critically, as to the means by which RFK was murdered, who was involved, and the need for justice in this case. Hence, we cannot and must not rest. It is time to set Sirhan free and bring to justice the real "perpe-traitors" of the crime in the assassination of Robert F. Kennedy. To refresh our collective memory: Robert Kennedy, moments after having won the 1968 California Presidential primary on night of June 5th 1968, concluded his victory speech on the stage in the Embassy Room of the Ambassador Hotel in downtown Los Angeles. About midnight, he and his entourage left the stage to the joyous applause of his supporters and was led to the hotel pantry area where he proceeded to greet the staff workers and others there. Suddenly shots rang out in the densely populated, closed in area surrounding the Senator and in the blink of an eye the presumed heir to the Presidency, a candidate committed to peace, civil rights and social justice, was lying mortally wounded on the pantry floor. With chaos and confusion all around, a young man, Sirhan Sirhan was seized, with smoking gun in hand, some 3-7 feet in front of the wounded Senator, wrestled to the ground while Kennedy lay bleeding. Rushed out of the hotel to a nearby hospital, RFK was pronounced dead at 1:44 PM the next day. "This is to certify that the autopsy on the body of Senator Robert F. Kennedy was performed at The Hospital of the Good Samaritan, Los Angeles, California, by the staff of the Department of Chief Medical Examiner-Coronor on June 6, 1968." According to Chief Medical Examiner-Coroner Dr. Thomas T. Noguchi, MD, "from the anatomic findings and pertinent history, I ascribe the death to: Gunshot wound of the right mastoid, penetrating brain." The "right mastoid" is the bony bump just behind and slightly above the level of your right earlobe. So, Robert Kennedy was killed, according to the official autopsy report, by a gunshot would to the brain, fired from the rear, behind the right ear. According to his declaration ("exhibit G") in the case, submitted in October of 2010, Dr. Cyril M. Wecht, M.D., J.D., a licensed medical doctor and medical examiner, who has "personally conducted approximately 17,000 autopsies and reviewed or supervised 36,000 other autopsies," and who having consulted with Dr. Noguchi on the case, was and is "extremely familiar with the autopsy report regarding Senator Kennedy," "the physical evidence, which is described in detail in his report, confirms that Senator Kennedy died of a gunshot wound which entered Senator Kennedy's head through the mastoid bone behind his right ear at point blank range, that is, at a maximum of one to one and one half inches, and moving forward." And further, "this can be stated with certainty because of the presence of powder burns at the entrance point." Dr. Robert K. Joling, a licensed attorney for over 60 years, authorized to practice before the Supreme Court of Wisconsin and the Supreme Court of the United States of America, past president of the American Academy of Forensic Science, and member of the board of the Forensic Science Foundation for 8 years, concludes in his October 25, 2010 declaration ("Exhibit A"), that the "fatal bullet was fired from a distance of approximately 1and 1/2 inches to the rear of the Senator's right earlobe and approximately 1/4 inch from his skull." So, to sum up, according to both Wecht and Joling, two well credentialed doctors, who affirmed Dr. Noguchi's extensive and highly competent autopsy, Robert Kennedy was murdered by someone standing behind the Senator and to his right, shot from behind, from behind and up close, fatally, behind the right ear. Now the problem with this fact is that it tends to undermine the official version of events, the accepted paradigm of the lone assassin. 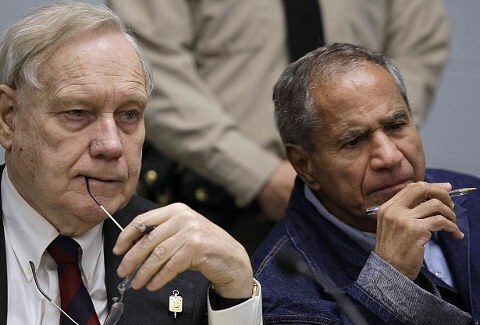 The raging contradiction here regarding the official story of RFKs murder is that Pepper and Dusek offer the sworn testimony of "12 RFK shooting witnesses establishing that Sirhan Sirhan was in front of U.S. Senator Robert Kennedy when Sirhan fired his gunshots in the pantry," making it impossible for Sirhan to have fired the fatal shot. A: "... some one reached around from the ... from the front, it would be to the Senators left as he was facing him, and ... I personally saw two shots fired ... he came running -- he came running towards the Senator." Q: "From what -- from where?" A: "From in front of us. From the direction in which we were walking." " ...she observed the Senator approaching. She stopped approximately in the middle of the room in the area between the first and second table and stood watching the Senator shaking hands with Hotel employees ... then she recalled a male enter her field of vision approximately three to four feet from her (between her and the Senator) about three to four feet to her left. She was looking at what would be the right rear of this person. She observed this person take his right hand, move it across his body in the area of his waist and then move his hand back across his body, extend his arm in an upward position and at this time she observed the gun and the flash of the shot. She heard three shots as she recalled ..."
A: "I was ahead of the Senator and the immediate party and going ahead of them with my hand raised to direct the party to the press room. They were going from the big Embassy Room to another room that had been set aside for the print media, and they were going through the kitchen. I was, at the time of the shooting, ahead of the party with the suspect between me and the party ..."
"After Senator Kennedy shook hands with Juan Romero I noticed a man pushing his way towards Senator Kennedy and Karl Uecker. I thought this man was going to shake hands with Senator Kennedy. He pushed himself around to the right of Karl Uecker. This man leaned around toward the left side of Uecker's body and extended his hand toward Senator Kennedy ... I heard a sound like that of a firecracker." "... I noticed a man who was to my left and who was smiling and who appeared to be reaching over someone in an effort to shake Senator Kennedy's hand. At about the same time I heard gunfire and I noticed that this individual was holding a gun in his hand. ... and that the gun was approximately one yard from Senator' Kennedy's head ..."
Q: "Where did you see the arm of the gun, please?" A; "Approximately here. I can't say exactly with reference to here, but approximately five yards from me, approximately three yards from the Senator." "...Uecker was holding Kennedy's hand ... Kennedy had stopped to shake hands with a dishwasher ... was slightly to right and in front of Kennedy. Saw suspect standing directly in front of him holding gun in right hand. Fired two or three times at Kennedy ..."
"The suspect was standing approximately four to six feet from the Senator ... his right arm was extended with the gun in his hand. Witness estimated the gun was about two feet from the Senator." " ... the senator was backing up and putting both of his hands and arms in front of him in what would be best described as a protective effort. The suspect appeared to be lunging at the senator." A: "When I thought about the firecrackers, I wanted, you know, and I turned around this way to my right." Q: "And how far would you say he was from you?" A: "Oh, I don't know. Again, I had -- "
Q: "Was he between you and Kennedy?" A: "When I looked back at first -- oh yes." Q: "He was between you and - you say he was six or seven feet ahead of the Senator and the newsmen?" "...The one clear impression I have is of an extended arm holding a gun. This arm appeared to be next to the serving table and the gun would be about even with the from edge of the serving table." And finally, Nina Rhodes-Hughes, whose July 1968, FBI statement reads as follows: "She had just left the entrance to the kitchen and noticed the Senator shaking hands ... when she suddenly heard a sound like a firecracker and she saw a red-like flash three to four feet from the left of the Senator's head." That was then. This past April 30, in an exclusive interview with CNN, 78 year old Nina Rhodes Hughes said she heard not one, but two guns firing during the 1968 shooting, and more than 8 shots (the maximum Sirhan's gun held), and that the FBI had extensively altered her account of the crime. "What has to come out is that there was another shooter to my right." In the eye-opening interview, Rhodes-Hughes reported that part of her view of Sirhan was obstructed and consequently she could not see the gun in his hand, but she said that as soon as she caught sight of Sirhan, she then heard more shots coming from somewhere past her right side and near Kennedy. She was hearing "much more rapid fire" than she initially had heard. Attorney Pepper contends that the FBI misrepresented Rhodes-Hughes' eyewitness account and that she actually had heard a total of 12 to 14 shots fired. "She identified fifteen errors including the FBI alteration which quoted her as hearing only eight shots, which she explicitly denied was what she had told them." She believes senior FBI officials altered statements she made to "conform with what they wanted the public to believe, period." "The truth has got to be told. No more cover-ups." Again, to sum up, twelve witnesses locate Sirhan in the pantry, with a smoking gun, but in a position from which he could not have inflicted the fatal wound to Senator Kennedy, nor any of the three shots that hit the Senator, which were, according to Dr. Noguchi's autopsy, all from the rear of Kennedy, the fatal shot from no further than an inch or less! Also, many witnesses in the pantry recall more than 8 shots fired. Logically then, we are forced to posit a possible second shooter, and ask if there is any other evidence, beyond witness recollection, of a second gunman involved in the assassination, a second gun? "In the case of the killing of Senator Robert F. Kennedy, I was able to determine the existence of two firearms being discharged during the shooting, verified through the identification of unique resonant frequency characteristics present in several -- but not all -- recorded gunshots." And further, "I confirmed that my analysis revealed; that 13 shots, or more, were fired in the pantry during that brief five second period of time; that five of those shots were fired from a west-to-east direction, opposite to the direction that witness accounts report as the direction in which Sirhan was firing (east--to-west); and that in two instances within those five seconds there were virtually simultaneous, or ?double' shots (shot numbers 3-4 and 7-8)." The "double shot ... clearly evidences that two guns were fired, given that Sirhan's weapon type cannot be fired anywhere near rapidly enough to account for the shot pairs -double shots- occurring as they do." This according to Philip Van Praag, in his November 14th 2011 "declaration" in support of a new evidentiary hearing for Sirhan. Van Praag is extensively qualified in the area of audio engineering and computer technology, having studied at California Western University (MS & BS Engineering), DeVry University (AAS) and other institutions, working for Ampex Corporation (Senior Instructor in the commercial Audio / Visual Products Division), Audio Consultants (Technical Services Manager) for Hughes Aircraft Company, and other audio/computer positions at places like Bell Laboratories and Sandia National Laboratories. "I also gained considerable experience from utilizing my personal audio / video equipment test facility, equipped with hundreds of audio related items representative of analog magnetic and digital recording methods, formats. technologies, test equipment and characterization capabilities from the inception of magnetic tape recoding in the 1940's." In 2005, Brad Johnson, a senior international news writer with CNN, (co-author of recent Rhodes-Hughes interview) contacted Van Praag, having read Van Praag's 1997 "Evolution of the Audio Recorder." Johnson asked if he (Van Praag) was familiar with the so-called "Pruszynski Tape," an audiotape that was recorded at the Ambassador Hotel by free-lance newspaper reporter Stanislaw Pruszynski and is the only known soundtrack of the assassination. According to Van Praag, Johnson asked that he "examine an audio cassette copy from (and created by) the California State Archives (CSA) that contained the content of Pruszynski's recording made at the Ambassador Hotel in Los Angeles, California during the June 5th shooting that resulted in the death of Senator Robert F. Kennedy." He agreed to do so and subsequently, "on or around August 6, 2005, I began to examine the sounds contained within the Pruszynski recording ... and in light of the discoveries comprising my findings, together with the Spangenberger-verified analysis, in my opinion the conclusion is inescapable that there was a second gun fired by a second shooter during the shooting that resulted in the death of Senator Robert F. Kennedy, and that the five shots from the second gun were fired in a direction opposite the direction in which Sirhan fired." So, numerous shots fired, people screaming, mass hysteria, and Sirhan himself, gun in hand, firing from a position inconsistent with Kennedy's wounds, who doesn't quite remember being there. How is that possible? Is it conceivable that he was manipulated to perform such an action contrary to his nature and one that he would be unable, after all these years, to clearly recall? Is this sort of mind control possible? "Is it possible to gain control of a person's mind to the extent that that person will unknowingly commit criminal or other antisocial acts, and then have amnesia for those acts? This is the topic I will address in my Declaration." "Exhibit G Declaration of Alan W. Scheflin", an Exhibit to the Petitioner's Sur-Reply submitted to the Court on February, 22, 2012, concludes, "that it is possible, with a small select group of individuals, to influence the mind and behavior beyond legally and ethically permissible limits." And although "it is uncomfortable to accept the idea that the human mind could be so malleable ... I firmly believe, it s more uncomfortable to deny it. The idea of a hypnotically programmed agent may be ?fantastic' ... but it is not untrue." Alan Scheflin is currently a Professor of Law, Santa Clara University Law School. He notes in his "declaration" that "my specialty area is Law and Psychiatry. In addition to law degrees, I also have a degree in Counseling Psychology." Scheflin has received multiple awards from the American Psychiatric Association, the American Psychological Association, the International Society for the Study of Dissociation, the Society for Clinical and Experimental Hypnosis, the American Board of Psychological Hypnosis, and is the only lawyer ever named as a Fellow of the American Society of Clinical Hypnosis. As the Past President and continuing Executive Board member of the International Cultic Studies Association, "I have for three decades been in communication with leading experts from around the world on brainwashing and extreme social influence." "My research since the 1960s has focused on the extreme limits on human influence, and particularly on the use of hypnosis and other social influence techniques to alter the way people think and act. As part of this work, I have read over 10,000 pages of declassified Central Intelligence Agency documents on the mind and behavior control programs run by the Agency beginning in the late 1940s. I personally know several of the leading researchers who participated in these programs." "I have qualified as an expert in court on the ?Manchurian Candidate' concept, and I have qualified in court as an expert in brainwashing, mind control and the anti-social uses of hypnosis." "Scientists, since at least the 1880s, have considered the mind as a territory to be conquered. American military and intelligence agencies have spent millions of dollars since the last half of the twentieth century conducting secret experiments whose express purpose it was to obtain dominance over the human mind." "As I got to know hypnosis experts in the United States and from around the world, I learned that the public image of hypnosis as benign was a cautionary position, though not an accurate position. In private, many of these experts tell a different story. Indeed, many experts, including myself, have appeared as consultants or experts in court cases involving the antisocial use of hypnosis ... At hypnosis conferences the topic of the dark side of hypnosis is virtually never discussed in a formal presentation." "For those hypnosis specialists who believe that hypnosis can only be used for good, A TOP SECRET CIA Report contradicts this position: ?Frankly, I now mistrust much of what is written by academic experts on hypnotism. Party this is because many of them appear to have generalized from a very few cases; partly because much of their cautious pessimism is contradicted by Agency experiments; but more particularly because I personally have witnessed behavior responses which respected experts have said are impossible to obtain.' [CIA Report, Hypnotism and Covert Operations 1955]." Finally, Scheflin concludes by stating that, "the creation of a hypnotically programmed assassin or patsy (distracter) is possible only with a very small percentage of people who fall within the category of ?high hypnotizables.' Sirhan Sirhan, based upon Dr. Daniel Brown's extensive psychological testing and interviews with him, meets the criteria for an ideal subject for this extreme form of mental manipulation." The "Declaration of Dr. Daniel Brown," also filed as an Exhibit to the February 22, 2012 submission, states that, "I am an Associate Clinical Professor in Psychology at Harvard Medical School at the Beth Israel-Deaconess Medical Center. In the course of my professional career I have been qualified as an expert witness on psychological assessment, memory, memory for trauma, and the effects of suggestive influence in numerous state and federal jurisdictions I have never been disqualified. I am the senior author of a textbook, Memory, Trauma Treatment and the Law (Norton, 1999) which was the recipient of awards from 7 professional societies including the Manfred Guttmacher award for the ?outstanding contribution to forensic psychiatry' given jointly by the American Psychiatric Association and the American Academy of Psychiatry and Law. I also served as an expert witness and consultant on three occasions for the prosecution at the International War Crimes Tribunal, The Hague, Netherlands." "I have written four books on hypnosis, including a standard textbook, Hypnosis and Hypnotherapy (Erlbaum, 1986, co-authored with Erika Fromm). I also wrote the current guidelines on forensic interviewing with hypnosis, which are in the current edition of The Comprehensive Textbook of Psychiatry. It is with these qualifications that I agreed to interview Mr. Sirhan B. Sirhan around his memory for the events leading up to and the evening of the assassination of Senattor Robert F. Kennedy." "In May, 2008, I was instructed by the attorney for Mr. Sirhan B. Sirhan, William F. Pepper, to begin a series of interviews with Mr. Sirhan. One purpose of the interviews was to conduct a detailed forensic psychological assessment of Mr. Sirhan regarding his mental status. The second purpose of the interview was to allow Mr. Sirhan the opportunity to develop a more complete memory, in a non-suggestive context, for the events leading up to and of the night of the assassination. The central question Attorney Pepper asked me to render an expert opinion about is whether or not Mr. Sirhan was a subject of coercive suggestive influence that rendered his behavior at the time of the assassination of Senator Robert F. Kennedy involuntary and also made him amnesic for his behavior and role in the assassination." "Memory exploration consisted of a systematic step-wise approach according to current guidelines for non-suggestive interviewing. These steps included repeated free recall, followed by repeated recall plus context reinstatement (a procedure known as the Cognitive Interview), followed by a focused interview with non-suggestive, open ended prompt questions, and lastly followed by free recall under hypnosis." Spending "over 60 hours interviewing and testing Mr. Sirhan," reading everything on the case, including FBI files, interviewing witnesses, administering myriad psychological tests, questionnaires, scales etc., Dr. Brown, "under penalty of perjury," arrived at a startling conclusion; that "Mr. Sirhan did not act under his own volition and knowledge or intention at the time of the assassination and is not responsible for actions coerced and/or carried out by others, and further that the system of mind control which was imposed upon him has also made it impossible for him to recall under hypnosis or consciously, many critical details of actions and events leading up to and at the time of the shooting in the pantry of the Ambassador hotel." "It is an indisputed fact that Mr. Sirhan fired a gun in the pantry of the Ambassador Hotel on the night of the assassination," Dr. Brown states. "The evidence revealed by my extensive interviews substantiates the less refined allegation that he engaged in this activity in response to a cue given by another party, and thus compels the conclusion that his firing of the gun was neither under his voluntary control, nor done with conscious knowledge, but is likely a product of automatic hypnotic behavior and coercive control. I am convinced that Mr. Sirhan legitimately recalled a flashback to shoot at target circles at a firing range in response to the port-hypnotic touch cue and did not have the knowledge, or intention, to shoot a human being, let alone Senator Kennedy. Even after 40 years Mr. Sirhan still is confused when told by others that he shot Senator Kennedy." On the day and evening of the assassination, "Mr. Sirhan's going to the Ambassador Hotel on the night of the assassination was not consciously planned. Mr. Sirhan did not know and could not have known that Senator Kennedy was going to pass through the kitchen area. Mr. Sirhan was led to the kitchen area by a woman after that same woman had received directions from an official at the event. Mr. Sirhan did not go with the intent to shoot Senator Kennedy, but did respond to a specific hypnotic cue given to him by that woman to enter ?range mode,' during which Mr. Sirhan automatically and involuntarily responded with a ?flashback' that he was shooting at a firing range at circle targets. At the time Mr. Sirhan did not know that he was shooting at people nor did he know that he was shooting at Senator Kennedy." "Mr. Sirhan freely recalled going to the gun range during the day of the assassination." Arriving at the Ambassador somewhat by chance later that evening, looking for a party, according to Brown, Mr. Sirhan recalled: ?Now I'm going to another area ... I don't know the name ... Later I heard it was the Embassy Room ... it's like a huge hallway ... tremendous lights ... no tables ... the brightness ... a lot of people ... I'm getting tired... I wasn't expecting this ... It's getting hot ... very hot ... I want to get a drink. A make-shift bar area ... I see a bartender... a white smock... he looked Latin ... we just nodded ... I told him what I wanted ... it's like I have a relationship with this guy ... Tom Collins ... I drink it while I'm walking around ... this bartender ... he wasn't looking for a sale ... he wasn't talkative ... it is like he's communicating with gestures ... a nod after I paid for it." "I'm still looking around ... he didn't make it (the drink) right in front of me ... he made it and brought it over ... after that I came back again ... it was like a routine between us ... like I'm more familiar ... like I'm a regular customer of his ... I don't remember seeing him before ... it seemed like he was a professional ... he never initiated a conversation but after a second time it was like there was a communication between us ... he knew what I wanted ... it's hard to figure out if he's targeting me or I'm targeting him ... I don't remember him saying anything like ?shoot Kennedy' or anything like that ... he's just very quiet ... I begin to get tired ... I want to go home ... I've seen the party." "It is noticeable that at this point in time Mr. Sirhan can only think about going home. Again, his expressed desire to leave the party and go home does not suggest the motivation of an assassin ready to kill a presidential candidate shortly thereafter." And Sirhan tried to go home. "I get in the car ... I couldn't think about driving the car ... it was late ... I sit in the car ... I couldn't make myself drive it ... There was no way I could drive the car ... I don't want to chance it ... I wanted to sleep ... I wanted to sleep ... sleep ... sleep ... sleep. Then I go back to the hotel to get some coffee." According to Brown, "Mr. Sirhan recalled re-tracing his steps to the same bar. When Mr. Sirhan arrived at the bar he asked the same bartender for coffee. The bartender told him that there was no coffee at the bar. An attractive woman with a polka dot dress was sitting at the bar talking to the bartender. She over-heard Sirhan asking for coffee and she said that she knew where coffee was. The woman in the polka dot dress then took Sirhan by the hand and led him to the ante-room behind the stage where Senator Kennedy was speaking." There they found some coffee at which point, Sirhan begins to feel attracted to her ("it was my job to woo her") when all of a sudden, according to Brown, "they are interrupted by an official with a suit and clip board. This official tells them that they cannot stay in the anteroom for security reasons, and the official then tells the girl in the polka dot dress to go to the kitchen." "All of a sudden they tell us, we have to move. This guy comes by wearing a suit ... darkish hair ... a big full face ... seems like he was in charge ... he wasn't wearing any uniform ... wearing a suit ... she acknowledges his instruction ... he motions towards the pantry. The man said, ?you guys can go back in this room.' I followed her. She led ... I was a little like a puppy after her. I wanted to go back to the mariache band ... but she went straight to the pantry area ... with my being so attracted to her I was just glued to her." "I am trying to figure out how I'm going to have her ... All of a sudden she's looking over my head toward an area ... Then she taps me or pinches me ... It is startling ... I thought she did it with her fingernails ... like a wake-up ... it snapped me out of my doldrums ... yet, I'm still sleepy ... She points back over my head ... She says, ?Look, look, look.' I turned around ... I don't know what happened after that ... She spun me around and turned my body around ... She was directing my attention to the rear ... Way back... There are people coming back through the doors ... I am puzzled about what she is directing me to ... It didn't seem relevant to me ... Some people started streaming in ... She kept motioning toward the back ... then all of a sudden she gets more animated ... She put her arm on my shoulder." "I think she had her hand on me ... Then I was at the target range ... a flashback to the shooting range ... I didn't know that I had a gun ... there was this target like a flashback to the target range ... I thought that I was at the range more than I was actually shooting at any person, let lone Bobby Kennedy ... [Brown: Recall your state of mind] My mental state was like I was drunk and sleepy ... maybe the girl had something to do with it ...I was like at the range again ... [What did the targets look like?] Circles. Circles... It was like I was at the range again ...I think I shot one or two shots ... Then I snapped out of it and thought ?I'm not at the range' ...Then, ?What is going on?' Then they started grabbing me ... I'm thinking, ?the range, the range, the range.' Then everything gets blurry ...after that first or second shot ... that was the end of it ... It was the wrong place for the gun to be there ... I thought it was the range ... they broke my finger ... [What happens next?] Next thing I remember I was being choked and man-handled, I didn't know what was going on ... later when I saw the female judge I knew that Bobby Kennedy was shot and I was the shooter, but it doesn't come into my memory." That's because he was in "range mode." According to Dr. Brown, "while interviewing Mr. Sirhan I, along with attorney Dusek, directly observed Mr. Sirhan spontaneously switch into ?range mode' on several occasions, where upon Mr. Sirhan automatically took his firing stance, and in an uncharacteristic robot-like voice described shooting at vital organs. Following brief re-enactments of ?range mode' Mr. Sirhan remained completely amnesic for the behavior." Finally, in the alleged "notebooks of Sirhan, which emerged after the shooting, the following words appear: "Alcohol will love love love love love love." Summing up the case, Dr. Brown makes the point that "in this passage Mr. Sirhan has made a connection in his recall between alcohol on the night of the assassination and his ?love' for the Polka Dot dress girl. Touching Mr. Sirhan on his shoulder and/or turning him round suggests a hypnotic cue to enter ?range mode,' to hypnotically hallucinate the firing range, and to fire automatically upon cue. My review of the eyewitness accounts in the kitchen at the time of the assassination suggests that giving Mr. Sirhan the cue to start shooting may have been synchronized to a second shooter and that the sound of the second gun may have also served as an additional cue to Mr. Sirhan to keep firing." "Maybe the girl had a kind of signal," said Sirhan in 1997. "I don't know. When she turned me around the Kennedy group kept coming in and she was trying to get my attention. When I spun around, that was the last time I saw her. I don't remember shooting. I don't remember aiming at Bobby Kennedy." Sirhan's lawyers have no doubt that their client was used as a patsy for this history changing political assassination, planned and carried out by forces determined to prevent Robert Kennedy from becoming President. Pepper asserts that the evidence of his actual innocence, which would be set out in detail if an evidentiary hearing is granted by the Court, would leave no doubt as to Sirhan's innocence, and his wrongful and fraudulent conviction, which has been sustained by a long standing cover up, would be overturned. "the denial of justice in this case is not only unconscionable in terms of both victims-the Senator and Mr. Sirhan- but makes a mockery of the criminal justice system in this Republic. We fervently hope that, at long last, the Court will grant the writ and set this innocent man free, order a new trial or, in the very least, set the matter down for an evidentiary hearing. To this end we ask for the support of the general public in every way possible, for the denial of justice to any one of us, diminishes the degree of freedom for all of us." See towards end of William Pepper, Sirhan's lawyer talks to CNN, part 2, also embedded above. William Pepper describes how psychologists who have interviewed Sihran Sihran agree that he is still under a state fo hypnosis. They believe that with further hypnosis, he can be de-hypnotised and recover his memory of what happened on the night of 5 June 1968. As a result of reading a recent article on Senator Robert F Kennedy (RFK) and commencing to republish it here, I was made aware of the extraordinary contribution to the fight for democracy and the environment and literature made by his son Robert F Kennedy Junior. Robert Kennedy Jr. "Crimes Against Nature"
Robert Kennedy Jr. Indicts the Bush Administration for selling-off the USA's natural resources, polluting the air & water, & poisoning tens of millions of Americans. Jun 29, 2011: Mountaintop removal doesn't just destroy our environment—it completely subverts the democratic process. In their efforts to mine mountains for coal, large corporations deceive local communities, flagrantly break the law, silence journalists and buy out local governments. In this conversation with The Nation and On the Earth Productions recorded at Chicago's Orrington Hotel, Robert F. Kennedy, Jr. explains how corporations have illegally destroyed more than five hundred mountains and impoverished countless rural communities—and gotten away with it. Kennedy has long been active in the environmental justice movement, and his latest efforts to stop mountaintop removal mining are featured in the new documentary, The Last Mountain.